A map is available at http://track.adamhooper.com/#2011-05-17--2011-05-24. I fell sick in Winnipeg and had to be nursed back to health. I introduce my latest web creation: http://track.adamhooper.com. It tells you where I've been and where I am. As I blog, you'll see improvements on that site. But enough about me. How about those Manitoba floods? They've been all over the Canadian news lately. The sun sets by a wind power generator near Moosomin, Saskatchewan. Is worthy of space on my site. And Wind coming, asking to fight. Requesting the wind to abate. Wind's gusts spun them 'round with a breeze. And cans cartwheeled west just to tease. Nathan Cooper injured his right knee somewhere after the first marathon's worth of his run to Nanaimo this February. He finished the 70-kilometre run anyway, and he later decided to carry his possessions in a cart rather than a backpack. When you're running across Canada, you run into unique problems—and you need unique solutions. Nathan Cooper runs alongside the Trans-Canada Highway west of Moose Jaw, Saskatchewan. Flat feels like this: a dull thud-thud. Your bicycle just bumped over a centimetre-wide crack in the pavement of the Trans-Canada Highway. It might be Alberta or it might be Saskatchewan; the road knows little difference. Look along the road and notice more cracks. Here comes another. Today the mountains deserted me. I'm past passes. And what marvels those passes are. A flag flaps at the top of Rogers Pass. Rogers Pass is a famous route through the Selkirk Mountains, just west of the Rocky Mountains. It rises to 1,330 metres in altitude. Major Rogers discovered the pass in 1882 for the Canadian Pacific railway, in return for $5,000 and the name. It avoided a 240-kilometre detour around the mountains. I crunched from 50 kilometres an hour to zero by means of asphalt. Whoops, I started with the climax. I'll rewind. The story begins with a block of cheese. It was Havarti and its price tag said $6.23. It called to me. I'd spent hours rolling downhill into Penticton, at the southern tip of Lake Okanagan, and I marvelled that the town has a Whole Foods, an American healthy-supermarket chain. I loaded up with three flavours of trail mix and some chocolate-covered ginger pieces (all the benefits of chocolate, minus the guilt). And here was this cheese. I was half-right. The B.C. gold rush developed the trading town, a decade after the Hudson Bay Company erected a fur-trade fort there in 1848. It has the same feel as Kahama. Motels and hotels abound, many with “nice clean rooms,” as advertised by the changeable sign letters competing for your business. It's a gateway town: to the west, you'll find the once gold-rich Fraser River and eventually Vancouver; to the north and east, three highways attack the mountains: the Trans-Canada, the Crow's Nest and the Yellowhead. As a journalist I ought to be covering the juiciest election stories, but I'm blissfully cycling past them. Somebody helpfully sprayed arrows to advance polling stations on busy Vancouver sidewalks. The number and size of campaign signs indicate how likely a candidate is to win, for two reasons. First, they're advertisements: ads work, and more ads work more. Second, signs cost money: candidates usually refrain from spending unless they think they've got a shot at the prize. Green Party leader Elizabeth May is ably contending with Conservative member Gary Lunn in signage—at least on the bike path between Sidney and Victoria on Vancouver Island. A man on a quick bicycle caught up with me. My bicycle, a brand-new Long Haul Trucker, was loaded with four paniers. His was naked, tuned for speed. We'd both exited the enormous Centennial Trail in Washington and headed north along an easy road that smelled of springtime and diesel. Was he remarking that he was faster than I was? Did I look like I was training? Canuck fever is all around. 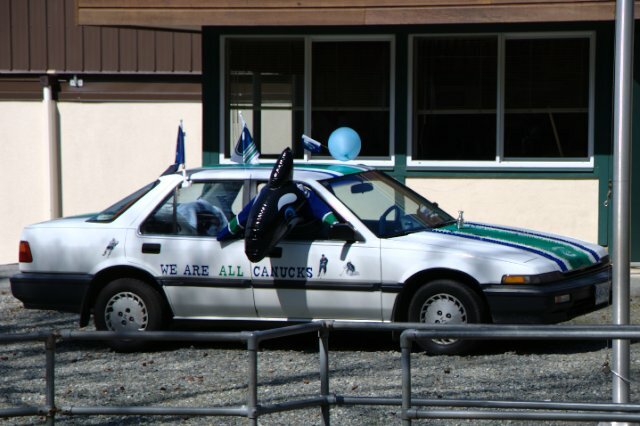 Outside a school on Vancouver Island, this car plugs the owner's preferred team. Some of my readers aren't "real" Canadians (either because they're not Canadian at all or because they're Canadians who don't conform to our national identity as our beer companies define it). For them, let me explain: the Vancouver Canucks is the top-ranked hockey team in the Western Conference this year. It's competing in a best-of-seven series with the team that vanquished it last year, the Chicago Blackhawks. Here's the status today: the Canucks won three in a row, then the Blackhawks won two. One team will soon be eliminated. It's the talk of barber shops, small-town diners, dinner tables and big-city billboards.